Bioidentical progesterone reduces the symptoms and discomfort of Uterine Fibroids without the side effects associated with synthetic hormone therapy. Clinical Studies indicate that progesterone curb uterine fibroids. Women may be able to lower the percentage of excess estrogen, thereby helping to shrink fibroids. 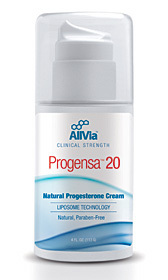 Progensa Progesterone has been critically acclaimed as the finest all natural bioidentical progesterone cream available. We have gratefully received numerous accolades from satisfied women and members of the holistic health care community. Bioidentical natural progesterone cream is made up of small, fat-soluble molecules that like many transdermal products are well absorbed through the skin. In fact transdermal delivery out performs oral pills by 80-90% in effectiveness. Initially, in progesterone deficient women much of the progesterone cream is absorbed by the body, in time, levels reach saturation and continued progesterone cream doses result in increased blood levels of progesterone and a stronger physiological effect, resulting in less and less troublesome symptoms associated with Uterine Fibroids. Most women notice results right away, while for others it may take up to three months of progesterone cream usage. Since every woman's fibroids are different in size and location, the time that you reach your maximum level of comfort may vary. For many women, natural bioidentical progesterone provides significant relief, with no reported adverse findings from usage by women for over 20 years. Natural bioidentical progesterone cream provides a safe and efficient way to help your body heal itself, the way nature designed the body to work. Progesterone is the most successful way of shrinking fibroids and proves to be much easier on the body than surgical methods. Studies indicate that bioidentical progesterone curbs hormonal imbalances associated with Uterine Fibroids. Clinical trials have shown uterine fibroids to be significantly improved by the use of bioidentical progesterone. Apply Progesterone once or twice a day as needed, starting on the 12th day after the first day of menstrual flow thru the 27th day. All women of any age who use progesterone cream for Fibroids should still take supplemental calcium (1000-1500 mg a day) to help prevent osteoporosis. Bioidentical progesterone cream is easily and quickly absorbed into the body so you can apply it almost anywhere with success. We recommend that you rotate the areas you apply it, to avoid saturating any one area. It is best absorbed where the skin is relatively thin and well supplied with capillary blood flow, such as the upper chest, breasts and inner thighs or inner arms. Massage into your skin until it is noticeably absorbed. 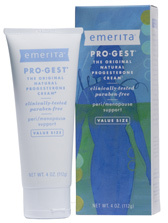 Natural bioidentical progesterone cream should not be applied over top of other body creams or perfumes as they may interfere with proper absorption. Uterine fibroid progesterone cream is not recommended when pregnant or breastfeeding unless your health care provider specifically recommends it. Natural bioidentical progesterone, (certified to contain 400 mg of USP-all natural bioidentical progesterone per ounce and 20 mg per despensing dose/1 pump). This herbal formula contains dandelion and vitex,(chaste tree) that helps the body remove exogenous, excess estrogen</a>)from synthetic hormone therapy, birth control or contaminated food. Commercially raised cattle and poultry are known to be fed estrogen to bring them to market sooner and heavier. Beyond the treatment of liver disorders, the herb milk thistle enables the liver to operate as it should helping the body metabolie estrogen. Naturopaths and holistic doctors look beneath the symptoms of an illness to its underlying cause, often discover that the liver has had a role to play. This is true across a vast range of different ailments including uterine fibroids. When a women has taken birth control, synthetic hormones or pharmaceutical drugs her liver functions less effectively and is unable to metabolize estrogen leaving a woman with excess which heightens premenstrual syndrome and the more serious condition, uterine fibroids. Related Articles on Uterine Fibroids-What You Must Know! Statements made by this site have not been evaluated by the Food and Drug Administration and are not intended to diagnose, treat, cure, or prevent any disease.Prop. 65 Warning: The product contains progesterone a chemical known to the State of California to cause cancer, birth defects or other reproductive harm.